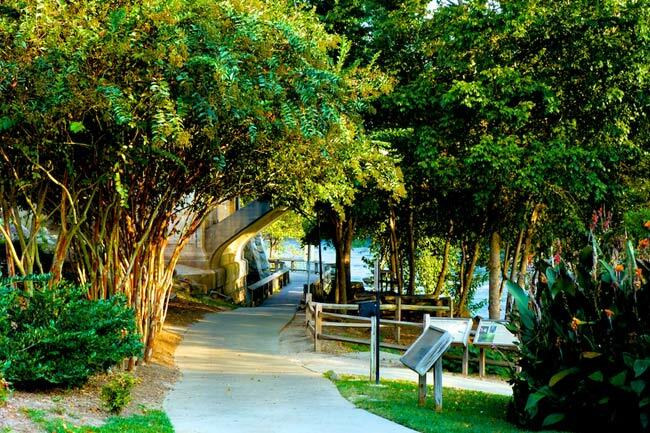 The Three Rivers Greenway in Columbia, West Columbia, and Cayce provides residents with a network of trails and parks centered around the rivers that flow through the capital city. 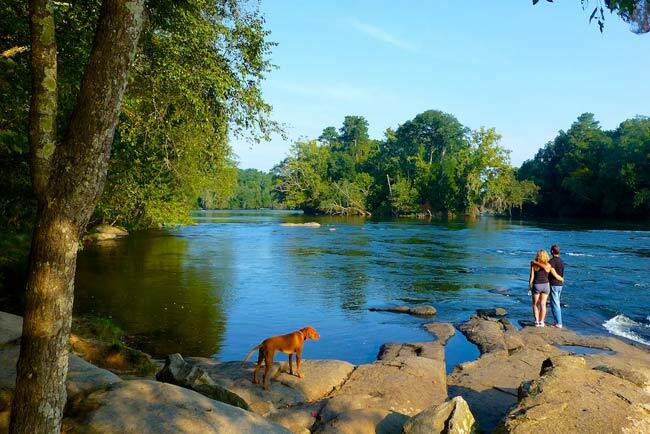 From paved walking trails visitors can see where the Broad and Saluda rivers join to form the Congaree River. 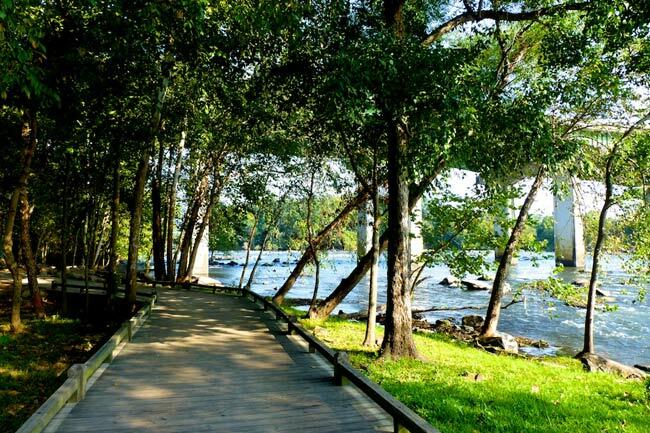 Forested paths and scenic river overlooks make the Greenway a popular place to relax after work or enjoy on the weekends. The Greenway is the result of the combined efforts of the aforementioned municipalities along with other private groups and businesses, including the Riverbanks Zoo, River Alliance, the Central Midlands Council of Governments, and the South Carolina Department of Transportation, to name a few. The first phase of the Greenway – Granby Park in Cayce – was completed in 1998. With a goal of stretching the Greenway to 12 miles, nearly 11 miles are currently complete. The most recent phase, called the Timmerman Trail, was built buy SCANA and completed in 2014. Many sections of the park feel far removed from the major city that surrounds it, while others afford spectacular views of the Columbia skyline. 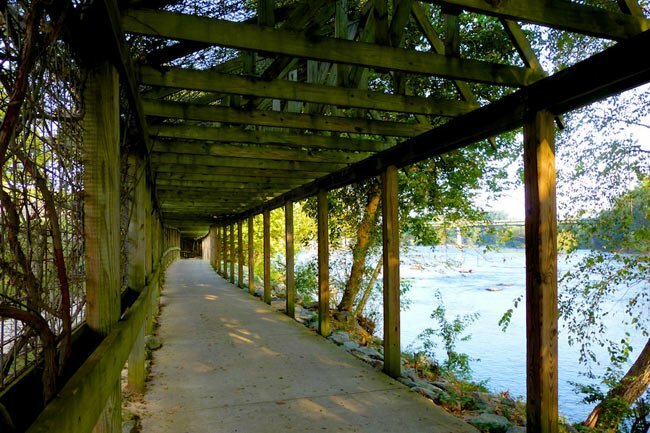 Not only is Three Rivers Greenway a great place to go for a stroll or bicycle ride along the river banks, but visitors can even catch a play or listen to live music at the amphitheater just off the Gervais Street Bridge on the West Columbia side of the Congaree River. For those who prefer water activities, there are a number of fishing spots and convenient kayak and canoe access points. In the late spring, rocky shoal spider lilies (Hymenocallis coronaria) bloom in a dramatic display. Extreme flooding in 2015 closed the park temporarily. There are several places to access the Greenway throughout the cities that support it. For more on the Three Rivers Greenway, be sure to visit the River Alliance, an organization that is working hard to promote the rivers of Columbia and the opportunities they provide. We don’t see anything officially about weddings but we would try contact city permitting offices in Columbia and/or Cayve to see what the specific requirements may be. Can the park be used for weddings? If so, who would need to be contacted? Have the trails reopened after the flood? I drove by there in November and a sign was posted that said the trails would be closed until spring. Is there a website that provides updates? Hi, Gabriel. Are you inquiring about the Three Rivers Greenway or the SCIWAY website? I haven’t checked on you guys in about 15 years. Where can I view a up-to-date plan and schedule? Is the top section above Broad River Rd Bridge open yet? It was closed for road work for a while. That’s the one section of the greenway I haven’t seen yet. Do they allow tents at Three Rivers Greenway? You can take you dogs and rollerblades, I rollerblade there every day. Dogs are permitted on leashes. Bikes, skateboards, rollerblades are all fine but no motor bikes. Can you roller blade at this park? Are dogs permitted to walk at Riverfront Park if they are on a leash? Thank you.